He had been an IAEA staff member from 1984, holding a number of high-level legal and policy positions, including that of Legal Adviser and subsequently Assistant Director General for External Relations. Dr. ElBaradei was born in Cairo, Egypt, in 1942, son of the late Mostafa ElBaradei, a lawyer and former President of the Egyptian Bar Association. He gained a Bachelor’s degree in Law in 1962 at the University of Cairo, and a Doctorate in International Law at New York University School of Law in 1974. He began his career in the Egyptian Diplomatic Service in 1964, serving in the Permanent Missions of Egypt to the United Nations in New York and Geneva, in charge of political, legal and arms control issues. During his career, Dr. ElBaradei participated in the policy and legal activities of many international and regional organizations, including: the United Nations General Assembly, the United Nations Security Council, the Conference on Disarmament, the International Labour Organization, the World Health Organization, the Commission on Human Rights, the United Nations Conference on the Law of the Sea, the Organization of African Unity and the League of Arab States. From 1974 to 1978 Dr. ElBaradei was a special assistant and legal advisor to the Foreign Minister of Egypt, in which capacity he took part in various presidential and ministerial delegations. In 1980, he left the Diplomatic Service to join the United Nations. From 1980 to 1984, he became a senior fellow in charge of the International Law Program at the United Nations Institute for Training and Research. From 1981 to 1987, he was also an Adjunct Professor of International Law at the New York University School of Law. 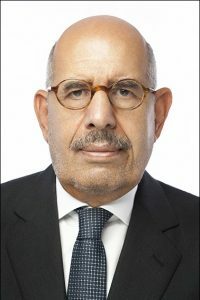 During his career as diplomat, international civil servant and scholar, Dr. ElBaradei has become closely familiar with the work and processes of international organizations, particularly in the fields of international law, global peace and security and international development. He has lectured around the world in the fields of international law, international organizations, global security, arms control and the peaceful uses of nuclear energy, and is the author of various books and articles on these subjects. He belongs to a number of professional associations, including the International Law Association and the American Society of International Law. In October 2005, Dr. ElBaradei and the IAEA were jointly awarded the Nobel Peace Prize “for their efforts to prevent nuclear energy from being used for military purposes and to ensure that nuclear energy for peaceful purposes is used in the safest possible way”. In its citation, the Norwegian Nobel Committee referred to the IAEA´s work as being of “incalculable importance”, and referred to Dr. ElBaradei as an “unafraid advocate” of new measures to strengthen the nuclear non-proliferation regime. In December 2009, Dr. ElBaradei has been appointed Director General Emeritus of the IAEA. Starting in 2010, Dr. ElBaradei became a prominent advocate for democratic change in Egypt and the promotion of freedom and social justice. He is an adjunct professor of Law at Cairo University School of Law and has been a board member of many associations, commission and universities, including: Global Citizenship Commission; Transparency International; the International Crisis Group; the Coalition of Dialogue on Africa; the Global Economic Symposium; the American University in Cairo; the United Nations High Level Commission on HIV Prevention. Dr. ElBaradei has received multiple other awards for his work as a public servant and as an advocate of tolerance, humanity and freedom. These include: Franklin D. Roosevelt Four Freedoms Medal; James Park Morton Interfaith Award; Academy of Achievement Golden Plate Award; Georgetown University Raymond “Jit” Trainor Award for distinction in the conduct of diplomacy; Karlsruhe “Mund Auf” award; Dortmund “Der Steiger Award for Tolerance”; “Prix de la Fondation” award of the Crans Montana Forum; Muslim Public Affairs Council (MPAC) Human Security Award; “Keys of the City” of Bari and Florence, Italy and Montevideo, Uruguay and “Distinguished Visitor” of La Paz, Bolivia and Quito, Ecuador; Honorary Patron of the Philosophical Society, Trinity College, University of Dublin; “Golden Dove of Peace” prize from the President of Italy; “Mostar 2007” International Peace Award of the Mostar Center for Peace and Multi-ethnic Cooperation; “Atoms for Peace” prize by the International Institute for Sustainable Peace (IISP) and the World Council of Nuclear Workers (WONUC); World Nuclear Association award; “Peacebuilding Award” of the EastWest Institute; International Seville NODO Prize for Peace, Security and Inter-Cultural Dialogue; Indira Gandhi Prize for Peace, Disarmament and Development; Delta Prize for Global Understanding, sponsored by the University of Georgia; XIV International Prize Grupo Compostela-Xunta de Galicia, Compostela Group of Universities; “Prize for Statesmanship”, Friends of Europe, Brussels. Dr. ElBaradei is the recipient of honoris causa degrees from New York University, the University of Maryland, the American University in Cairo, the Free Mediterranean University (LUM), Bari, Soka University of Japan, Tsinghua University, Beijing, the Polytechnic University of Bucharest, the Universidad Politécnica de Madrid, Konkuk University, Seoul, the University of Florence, the University of Buenos Aires, the National University of Cuyo, Argentina, Amherst, College, Cairo University, and the University of Dublin, Trinity College. He has also received a number of decorations, including: the Greatest Nile Collar – the highest Egyptian civilian decoration; “Grand Cross of the Order of Merit, Chile, The Order of the Republic, Tunisia; The Order of Rio Branco, Brazil, Francysk Skaryna Order, Belarus and “El Athir” Award, Algeria; Grand Decoration of Honor in Gold with Sashes, Austria; Grand Decoration with Star and Sashes, Germany. Dr. ElBaradei is married to Aida ElKashef, an early childhood teacher. They have a daughter, Laila, a lawyer, married to Neil Pizey, an investment banker – who live in London – and a son, Mostafa, an IT manager, who lives in Istanbul. They have two granddaughters: Maya and Nina.